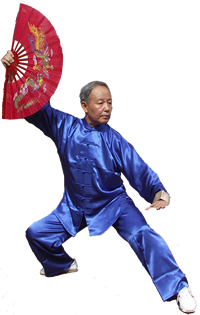 Professor Li Deyin is one of China's most famous Tai Chi, Xing Yi and Bagua Masters. He ws designated as one of humdred martial arts treasures of China , International judge, master trainer for the first generation Wushu Judges in the world, Vice Chariman of Beijing Wushu Association, creator of 42 Step Taijiquan, 48 Step Taijiquan, Taiji Kungfu Fan, Xiyangmei Taiji Kungfu Fan. He is also the highest authority on 24 step simplified Yang style taijiquan, 88 Step Traditional Yang Style Taijiquan, Wudang Taiji Sword and and 32 step Ynag Style Taijijian. Professor Li was born in to one of China's most influential martial art families, his grandfather Li Yulin was the first generation to study Shaolin, Xing Yi, Bagua and Taiji. At an early age, Li Yulin's mother sent her only son to famous wushu masters with hopes of health and self-preservation. He learned Shaolinquan and Xingyiquan from masters Li Cunyi and Hao Enguang; he learned Xingyiquan, Sun style taijiquan and baguazhang from master Sun Lutang; and he learned Yang style taijiquan and Wudang Tai Chi Chuan from master Li Jinglin (a disciple of Yang Jianhou). Li Yulin continued studying wushu into adulthood. He became the president of the Shanghai Shangde Wushu Institute, the main coach of the Shandong Wushu Institute, and the publisher of Harbin Taijiquan Press. He gained the honorable title "Pioneer of Taijiquan" in Northeastern China. Both of Li Yulin's sons followed their father's footsteps. Professor Li Deyin's father Li Tianchi became a doctor. 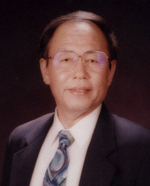 He integrated wushu, medical science, and tui na (massage) in order to better treat his patients. His name and medical treatments became famous all over Harbin and Heilongjiang. Professor Li's uncle Li Tianji studied wushu from his father, Li Yulin, as well as from his father's masters, Sun Lutang and Li Jinglin. He graduated from the Shandong Wushu Institute, became a college professor, the executive of the Harbin Wushu Federation, and the first chief coach of the China Wushu Team. Li Tianji has been memorialized as one of the "Ten Best Wushu Masters of China (Zhongguo Shi Da Wushu Mingshi)." In 1956 Li Tianji created the first standardized simplified taijiquan in Chinese history: 24-Form Simplified Taijiquan and 32-Form Simplified Taiji Sword. Both forms opened the door of taiji to novices and non-athletes, and both are now extremely popular all over the world. For this, he earned the title "Father of Contemporary Taijiquan." Li Deyin was born in 1938 in Hebei province. He was raised in a culture of wushu and began training when he was eight years old. His grandfather, Li Yulin, insisted that Li Deyin practice wushu every evening after school, without exception, beginning with the basics of Xingyiquan's Santishi and taijiquan's commencing form, and working up to all other styles and difficulties of wushu. This became Li Deyin's routine all year round, even in the coldest of the winter and the hottest of summer, for twelve consecutive years. 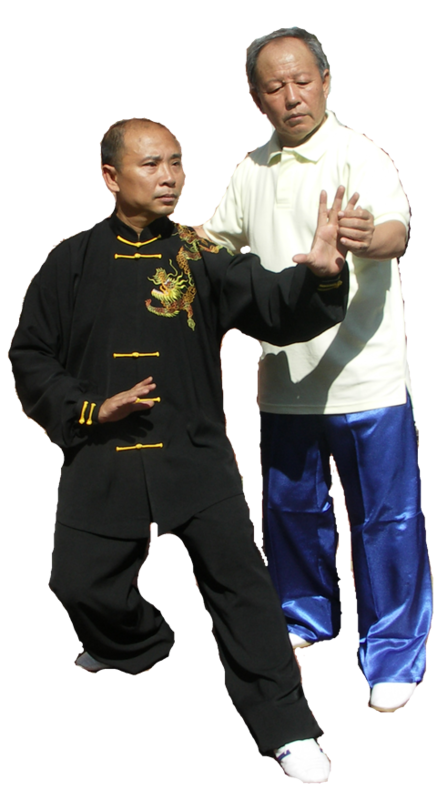 Under his grandfather's strict supervision, professor Li learned Shaolin, Xing Yi, Bagua, Yang Style taiji and Sun style Taiji. By virtue of such intense training under his family's patriarch, Li Deyin grew accustomed to perfection in wushu. As an adult, wushu took him to all different regions and masters in China. He traveled to Shaolin Temple and Mount Wudang to study from advanced abbots; he sought out Master Li Jingwu to learn Chen style taijiquan, Master Xu Zhiyi to learn Wu style, Master Sun Jianyun for guidance on Sun style, and Master Hao Jiajun to refine his Yang style and Push Hands. Before 1960, taiji was not taken seriously. It was considered more appropriate for street performers than for the common populace, "difficult and mysterious" rather than safe and healthy. Li Deyin, though, always knew better. Taijiquan is a traditional Chinese martial art and a Chinese national treasure. It integrates the physical external and the meditative internal. It is one of the few sports that improves balance, coordination, flexibility, muscle strength, and cardiovascular health. It is gentle enough to be accessible to the elderly and infirm, yet demanding enough to pose a significant challenge to the most professional young athlete. Taijiquan is beneficial to people of all ages and all lifestyles. When Li Deyin came to Beijing to entered college, He carried on his training with hs uncle Grand Master Li Tian ji, who was the creator of Wudang Taiji Sword and the main person to structure 88 Step Yang Style Taijiquan.his original idea of becoming an economist was rapidly eclipsed by his superb skills in the sports, such as the hurdles, motorbike racing, and, of course, martial arts. While still an undergraduate, he represented his university in a taijiquan tournament in Beijing; his strength and elegance in wushu were so exceptional that, besides winning the gold medal, he actually created a following, and taijiquan became a popular sport among Chinese college students. Immediately after Li Deyin graduated, Renmin University (People's University) in Beijing hired him as one of their youngest professors ever. Because of him, taijiquan has become a for-credit class at all Chinese universities, and 24-Form Taijiquan has become a required class for physical education majors. In 1959, Li Deyin trained and organized a team of college students to compete in Beijing. Not surprisingly, the team won 13 gold medals and the group competition championship. Since then, taijiquan has become one of the most popular university sports. There is a difference between taiji for competition and taiji for health, notes Li Deyin. The former should be strictly accurate according to accepted choreography and held to rigorous standards of strength, flexibility, fluidity, and stability. The latter can be practiced in any style or sub-style of taiji, performed at any level of physical prowess, and should be given only encouragement. The purpose of competitive taiji is perfection; otherwise, taiji is for health and enjoyment. 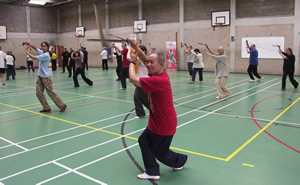 In order to make taijiquan more enjoyable, Li Deyin had music composed for 24-Form Taijiquan and 32-Form Taiji Sword. He has also rewritten many taiji books and, at the invitation of video and television producers, made a significant number of instructional videos and television programs. Numerous articles have been written about Li Deyin's contributions and achievements in China and many other countries, especially Japan. People seek out Li Deyin's materials. His style is simple and profound, accessible to the average person and indispensable to the professional athlete. His instructions are guaranteed to be excellent: he has broken down every stance, form, and transition into clear, distinct movements. He gives precise directions, applicable explanations, and perfect visual examples. His teaching is honest, direct, and very efficient. He addresses real problems encountered in practice and performance, both stylistically and specifically. The way he performs and teaches taiji is guaranteed to be correct in the eyes of all judges. More importantly, he is one of few who are able to express the passion and strength beneath taiji's soft veneer. For the sake of unity and competition, it is good to have standards and requirements. Li Deyin and a wushu committee created, edited and standardized all taijiquan competition routines, namely Yang, Chen, Wu, and Sun styles. Among all contemporary and traditional taiji routines, competition routines are considered the best because they include the most important elements of their respective styles with a minimum of repetition. By 1976, the rapid growth of popular and competitive taiji demanded a comprehensive routine that would embody all the different styles. 48-Form Taijiquan was Li Deyin's first attempt at a comprehensive taiji routine. Working with a committee of taiji masters, he created this form as a combination of the 4 major styles plus elements of Push Hands. Though 48-Form Taijiquan did not become the international standard for competitive taijiquan, it is a beautiful form that has become very popular throughout the world. In 1989, a committee of great taiji masters, lead by Professor Li Deyin, created 42-Form Taijiquan Competition Routine. This routine is stronger, more beautiful, and shorter than 48-Form (also created by Professor Li Deyin), which makes it altogether much more appropriate for international competition. The next year, International Wushu Federation announced 42-Form Taijiquan Competition Routine as the first ever universally standardized taijiquan competition routine, and the official taiji competition routine of the 11th Asian Games. Now, over 15 years later, 42-Form is still considered the most complete standard by which a taiji competitor can be judged, as well as one of the most beautiful taiji forms in existence. In support of the bid for Beijing Olympics 2008, Professor Li Deyin, assisted by Master Fang Mishou and Master Faye Yip, created one of the most popular Fan forms in the world, the "Taiji Kung Fu Fan", which demonstrated by millions of people throughout China and now the beautiful fan form has taken the whole world by storm and hundreds of millions of people are practsing it. 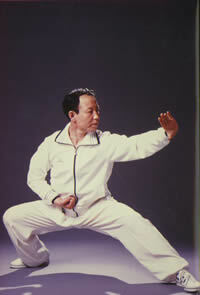 continuing the success of the form, professor Li go on to create the Xiyangmei Taiji Kung Fu fan routine. As vice president of the Chinese Wushu Association, Li Deyin holds the responsibility for many important events. Li Deyin has established over 200 taijiquan practice stations in Beijing. In the past 20 years, he has trained thousands of volunteer taijiquan coordinators and teachers. With the support of his many friends and peers, Li Deyin has organized taijiquan tournaments all over China. He coordinated a magnificent ten-thousand-person performance of 24-Form in Tiananmen Square. For the opening ceremony of 11th Asian Games, Li Deyin organized and led fifteen hundred Chinese and Japanese people in a performance of 24-Form Taijiquan, the first time that people of the two nations performed together officially and openly in such a large venue. Most of his students were world champions and some of the best Taiji Teachers in China and around the world. Professor Li Deyin has earned numerous titles and awards, among which are "International Wushu Judge" and "China's Best Judge." At the 11th Asian Games, Professor Li Deyin was the chief judge. He has trained many judges in classes set up by the International Wushu Federation, and given numerous lectures all over the world explaining the rules, requirements, and standards of taijiquan competition. In 1975, Li Deyin realized that foreigners coming to China were interested in taijiquan. At the time, however, there were no facilities or resources for international taiji instruction. In response, Li Deyin collaborated with other taiji instructors and opened the first international recreation taiji center in China. Classes were established for non-Chinese residents who studied or worked in China, including foreign embassy employees. In just two years, over 600 people from 50 countries participated in taiji classes. The Ambassador of Madagascar learned taiji in China. His impression: "In ancient history, the Chinese grape was delivered to my country, and it has become one of our favorite fruits. 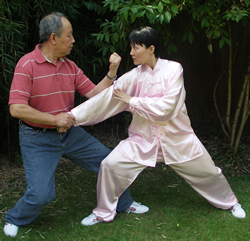 Today, I intend to carry taijiquan home with me and make it one of our favorite exercises." When Former President George Bush was the US ambassador to China, his wife Barbara Bush studied at one of the Beijing international recreation centers. At the center's graduation ceremony, she joyfully represented the American students in a performance of taijiquan. But since not everybody can go to China to learn taiji, Li Deyin has traveled nearly everywhere to teach taiji, including Taiwan, Hong Kong, Macao, Japan, England, the United States, Sweden, and Switzerland. When the door of China was opened to the world in 1981, Li Deyin, representing the city of Beijing, made his first trip to Japan to teach taijiquan. Since then, Li Deyin has made special teaching trips to Japan every year for the last 20 years. Over one hundred thousand Japanese people have studied from Li Deyin. Every taiji practitioner in Japan knows his name. In 1982, on his tour of Beijing, the Japanese Prime Minister Suzuki Yoshiyuki made a special appointment with Li Deyin for a taijiquan lesson in his hotel room, squeezed into his busy schedule. Li Deyin first taught in England in 1989. In order to demonstrate the foundations of taijiquan, Li Deyin and a British coach performed Push Hands on stage: Li Deyin gently moved his body back and forth, and the British coach flew across the stage. The audience was stunned. Many of them began training with Li Deyin, and now, after ten years of hard work and dedication, most of those British students have become masters themselves. Li Deyin's popularity has grown so much that his daughter Li Faye founded and instructs at the "Deyin Taijiquan Association" in England. World Class Students and now Great Masters. Many of Li Deyin's students have become great taiji instructors and judges. World renowned Chinese athletes Gao Jiamin, Chen Sitan, Su Zifang, Huo Dongli, Wang Erping, Kong Xiangdong, Fan Xueping, Su Renfeng, and Zhou Yunjian all call Li Deyin their shifu. Japanese athlete Morita Hisako began as a housewife interested in taijiquan; under the tutelage of Professor Li Deyin, she won the Japan and Asian Wushu Competition championship. In the UK and Europe his family tradition is being carried forward by his daughter Master Faye and Master Tary Yip, one of his first Indoor disciples, both are highly respected Taiji and Xingyi Masters in the UK and Europe. Together they set up the Deyin Taijiquan Institute (GB) and Deyin Taijiquan. They have also built close networks with enthusiasts all over Europe and constantly travelling to conduct teaching on all the routines as taught by Professor Li.